A human ant-hill… Derinkuyu, meaning “deep well”, is an amazing underground city burrowed 8 layers deep into the soft volcanic tufa that gives the land around Cappadocia its malleable characteristics. 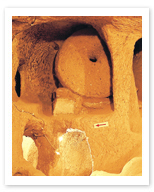 Derinkyuyu is the largest of several underground cities, and was used as a shelter during times of trouble up above, when marauding armies thirsty for conquest were an all too familiar occurrence in this part of the world. As you duck around a maze of subterranean rooms and question whether or not you’re claustrophobic, you may be surprised, or horrified, to know that the entire town, livestock and all, would fit into and hide in these underground cities. These extensive maze-like dwellings offer a truly fascinating glimpse into the resourcefulness and hardiness of the people who inhabited this land in much less certain times.